Well, it sounds like Scout is a very lucky dog with you as her doting owner! I wish all dogs were as well taken care of as yours and mine are. It's wonderful that you are able to do rescue for the poor homeless dogs. I am very happy that you found a home for that one rescue you had. It sounds like a great home and I hope it works out and the dog has a forever home now! I have several dogs who were strays or unwanted pets. Most of them I will keep because I've had them so long that they are MIINE or I am THEIRS. lol. And they have their little quirks and habits that I am already accustomed to. A couple of them are old now--11 or 12. They are quite content to live with me and I don't know if they'd adapt to a new life. But I look for homes for some of them and tell the people that I will take them back if they don't work out. Anyway--this one that I just placed loves children and I have no children. She will be ecstatic there. I keep in contact and have checked on her several times this week. This is her first time to be placed. I picked her up after she'd been at my workplace with no collar on for several days in the winter. I put an ad in the local paper and no one answered it. I had her spayed and got all her shots. She's a healthy and active little mutt! I also got my cat from the humane society. She is 16 now--kinda feeble, but still spunky. Thanks, that's sweet, Susie. Most Brokies have good hearts!! I love Brokies. Especially Brokies who love kids and animals!! Get a huge wad of paper towels. Put a plastic bag right beside the corpse. Pick it up with the paper towels and put it in the plastic bag. Tie the top tightly twice!! Speaking from experience here! ICKY!! Yes - that is pretty much what I did! Eeeeww!! I can sympathize about the mouse. I once lived in an apartment building that had a bit of a mouse problem during my last few months of occupancy. It was awful. Luckily, I was able to move away within a few months of the time the infestation became really noticeable (and this was before I had my cat). Even the exterminator really didn't know what to do about the situation (it was really clear that that was the case). Anyway, I decided to pop in here and ask some pet care advice. This is of course cat related since my only pet is Vivien the cat. I'm wondering if other cat owners might have tips on dental care for cats. The cat I grew up with, Polly, ended up having horrible dental problems when she was an older cat. She lived a wonderful, pampered, long cat-life in general... but by the time she was 17 her teeth were awful and many of her trips to the vet had to do with dental care when she was old. So, with Vivien (she's only 2 years old still), I want to try to take better care of her teeth so she won't end up with the same dilemma when she's old. I bought a book on cat care that attempts to describe how to brush a cat's teeth... and I went to Petco and bought Vivien cat toothpaste (for $8 a tube!!!) and the most adorable little cat toothbrush you've ever seen. But, I simply can't get her to submit to a toothbrushing. I've had the supplies for months and months and I've read my book of instructions... and Vivien will have none of it. I feel like the ordeal is too traumatic for her for me to push her too hard on the issue. So, I'm wondering if other cat owners and lovers might have cat dental care tips? There are some 'teeth-healthy' chew treats out there. One prescription kind is called C.E.T. chews. Kibble is also better than canned food in terms of dental health. If your cat won't let you brush, regular dentals may help - but it's important to make sure your veterinarian does a true dental (under anesthesia), because just scraping off the tartar with a fingernail doesn't count. I think there is some genetic variation in terms of whether or not cats will have 'bad teeth.' My adult female cat Pepper is almost 8. She has absolutely beautiful teeth, and I have only tried to brush her teeth about three times in her entire life, AND she has never had a dental. She is meal-fed dry food and only gets treats on occasion. Thanks! I give Vivien "Greenies" dental treats, which she seems to really like. And, she eats a healthy amount of dry food. But, I do give her a small can of wet food at night and in the morning. Often she'll bypass the wet food for the dry food though... which I've always found fascinating in terms of her own little personal kitty taste. I think the worst part for her with brushing is that she really dislikes me touching her mouth or the suggestion that I'll hold her lips back. The good news is that she seems to like the taste of the cat toothpaste. I can get her to lick that a little bit. The cat book said to get her to like the toothpaste, which seems to have worked in this case. So, it's definitely the restraint that bugs her. Maybe I'll gently try to play with her a bit to see if she'll gradually, over some time let me touch her mouth some more. Well, I can officially tell you that while President Bush may favour doggies, in the UK, the ones in command like MOGGIES! The last occupant of 10 Downing Street became an embarrassing irritant after a decade and was finally put out to grass to spend their remaining years in obscurity. Now there is a new, Scottish, face at the head of the Cabinet table who is loved by everyone and who has the run of the place. 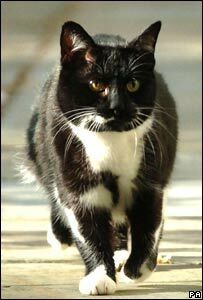 It must be one of the most privileged, and soon-to-be best known cats in British public life. Sybil - as in Basil and Sybil Fawlty - the black and white moggie is much loved in the home of the current Chancellor of the Exchequer, Alistair Darling. And that home is now the flat above the heart of Britain's government - 10 Downing Street - where the Darlings, including Sybil, have moved to from north of the border. Prime minister Gordon Brown's official spokesman confirmed a new cat was in residence, adding: "The prime minister and Sarah do not have a problem with it. I am sure the cat will appear at some point." You bet it will - the media's picture desks are already demanding a photocall with the celebrity feline. Asked if the moggie was being given free reign in the building, the spokesman pointed out cats were not the easiest of animals to deny access to. However, Sybil is unlikely to face the same fate as her predecessor, Humphrey, who had stalked the corridors of power for years after wandering in during Margaret Thatcher's reign in 1989. He was perfectly at home snoozing on the prime minister's chair at the Cabinet table and chasing mice, when he could work up the enthusiasm, but was moved out six months after Labour's 1997 general election win. There were all sorts of dark rumours about Cherie Blair's role in the move and she was forced to deny her dislike for the animal was to blame. Eventually, almost a decade later, Humphrey - named after the Whitehall mandarin Sir Humphrey from the TV series "Yes, Prime Minister" - passed peacefully away at the home of a Cabinet Office worker who had taken him in. Official questions were asked in the House of Commons about Humphrey's absence and health after his departure from Downing Street in 1997. The media were later invited to a South London property, where Humphrey was photographed, hostage-style, with copies of the day's newspapers. If I were Sybil, I would do the photo-call as soon as possible - once you've made it to the front pages no occupant of No 10 would want anything to happen which might alienate the cat vote.